After going to the Honeywood Museum last month only to find that I had misread the opening times (it is open Wednesday to Sundays & bank holidays), I recently paid a second visit, and was relieved to see an open sign at the door. Their modest but airy tea room is a nice place to grab a bite after your visit. Originally called Wandle Cottage, the museum traces the history of the surrey area, from its changing environment, growing industries, and to the people who lived there. It is a quaint building, with lots of different rooms and staircases, and you are free to go round them in no particular order. After you've looked around inside, it is lovely to sit outside and admire the beautiful views, while having a bite to eat from their tea room. The menu offers a small selection of inexpensive snacks, pannini, and sandwiches. Aside from the permanent displays, the museum has a small exhibition room where they promote local artists. At the moment they are currently showing the work of watercolour painter, Karen Baker, which features vintage British town life. Her paintings are on sale for £100-£130, up until the 9th June, and will then be followed by the exhibit, A Novelist's Story between 12th June - 28th July. Entrance to the museum is via the gift shop. There are a few nik-naks such as coasters, notepads, and mugs, but most of what is available is for kids. It's the general kind of thing that will keep them entertained for the afternoon, and then get shoved in the drawer and forgotten about once they get home. The upper pond outside the museum is a tranquil place to spot herons. The name Carshalton was inspired by the vast number of ponds, rivers, and lakes that can be found in the town. 'Cars' derives from 'cress', signifying the watercress that grew there, 'hal' from 'aul', which was the word for well, and 'ton', which meant an enclosed farm. Although the ponds are Carshalton's most distinctive feature, none of them are natural. They were all designed by landowners, including the Earl of Arundel, who built the pond outside the museum in the 1630s. Volunteers at the museum often arrange free guided walks around Carshalton, in which you will come across many of these scenic views. 19th century resident, John Kirk was a photographer. As I said before, the Honeywood Museum used to be called Wandle Cottage; its named was changed, when the photographer, John Pattinson Kirk moved in, in 1879. The cottage was part of a larger estate, which included another building that called Honeywood House. That house, was structurally unsound, so Kirk demolished it, and expanded Wandle Cottage, renaming it at the same time. The drawing room is shown as how as it might have looked when Kirk lived there..
Kirk and his wife Leah had an adopted daughter called Lily. Lily was a painter, and many of her paintings are on display around the museum, including the drawing room where she used to paint. While I was looking round the drawing room Charleston style music began to play from out of nowhere. Suddenly the curtains closed by themselves and a projector screen appeared. Once I had established that I wasn't being haunted by a poltergeist, I watched the automated film that was being shown. An actor portraying one of Honeywood's servants started describing her daily duties, and also some interesting facts about Carshalton, such as elephants having once been washed in the pond outside. 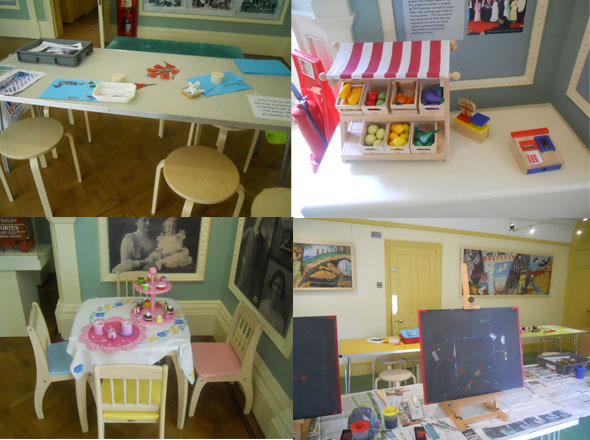 The museum is a great place for children; in the next room there is lots of interactive learning and play. The kids can dress up in period costumes, play shop, and get creative with crafts. The displays describe all the types of recreational activities that children used to get up to in the town, and compared it to modern day play. Members of the Girls' Guide Movement. In 1909, the Girls' Scouts Movement was formed. A group of girls disguised themselves as boys and snuck into a boy scouts rally at Crystal Palace. They demanded that the scouts founder, Robert Baden-Powell, 'do something for girls'. There are now a hundred and forty-four girl guide groups across different countries. Upstairs, the museum dedicates a number of rooms to the industrialisation of Carshalton. Many mills and factories were established from the 18th century onwards, including the[ LINK=https://www.weekendnotes.co.uk/carshalton-water-tower-hermitage/]water tower[/LINK] in 1720, a paper mill, cotton mill, logwood mill, brewery, and two chocolate factories. While this was good for trade and the economy, it had unfortunate environmental effects. In one display case, there is a trout called Terrance. By pressing the interactive display, Terrance talks to you (in a rather sultry voice), about how he was caught in 1898. Because of all the pollution caused by factories, by 1915, there were no more trout left in the River Wandle. Since then, the trout have been reintroduced and are thriving once more. Kirk left Honeywood House to Lily in his will, and although he bequeathed the equivalent of £1 million, the money quickly ran out. Lily took out a mortgage and set up a tea room, but eventually she had to sell up to the council. During World War Two, Honeywood House was used as a training site, and a place to store air raid equipment. There are many pictures of local residents who fought in the war, as well as medals, plaques, and a uniform worn by Ernest Geiringer, who was a member of the Home Guard. You can also tune into an old fashioned radio. There are many channels, including a speech by Churchill, news reports, interviews, and a music channel. There is even static for authenticity. The final area takes a look at the urbanisation of Surrey, starting with Thomas Alcock, a wealthy liberal MP who introduced the Croydon to Epsom railway in 1847. This started a battle between progress and nostalgia. Although transport and new housing would benefit the area by attracting middle class families, increasing business, and improving living conditions, many residents opposed urbanisation because they thought it would ruin the rural landscape and damage the environment. These same od battles are still being fought today. Some things never change. Progress won out, and by the 1950s, Surrey had reached an enlightenment era. Retailers started flocking, with Sutton's first redeveloped Marks & Spencers store opening in 1952, followed by the Royal Marsden Hospital in 1961. Several office blocks were built in the 1960s, and Sutton's Central Library was opened in 1975. Thanks Bryony, I love the way you un-earth these small museums and other places to visit in my local area - keep up the good work!